It was disgusting so I threw it away. One day ago I tried the recipe again.. It was still disgusting so I threw it away. During this experiment I gained a wealthy of knowledge. Most importantly my people..know this. The end result photo of a recipe can be absolutely stunning, breathtaking, mind blowing, or C all of the above. However, the actual recipe can be a mess. I should of known when the cheapest ingredient was the lemons. Everything else had me at Whole Foods spending my life savings. I should of known when I called my grandma (who is supposed to know everything about cooking) to ask about Millet flour, only for her to tell me that "it's not flour, its a very ugly hair cut". Then spend the next hour on the phone trying to explain that I wasn't getting my hair done like circa 1990's Billy Ray Cyrus but just trying to describe what I was making. All the while standing in the produce section yelling into my phone, because she is also a bit hard of hearing. The conversation ended with me promising never to cut my hair and her telling me you should only use White Lily flour. As well as going into detail about the recipe I just described sounding like a disaster waiting to happen. How many times have you looked at some of these amazing food photos and instantly went on a mission to create it.. You were so drawn to the allure of that perfectly plated dish, sitting atop an old primitive wooden table, that you failed to actually pay attention to the crap that made up the dish. That is, until your attempts at recreating it results in something..
What's the word I'm looking for here. How many times have I said that in this one post. I'm trying to make a point here... clearly. I gave up after the 2nd try. But was left with several lemons.. 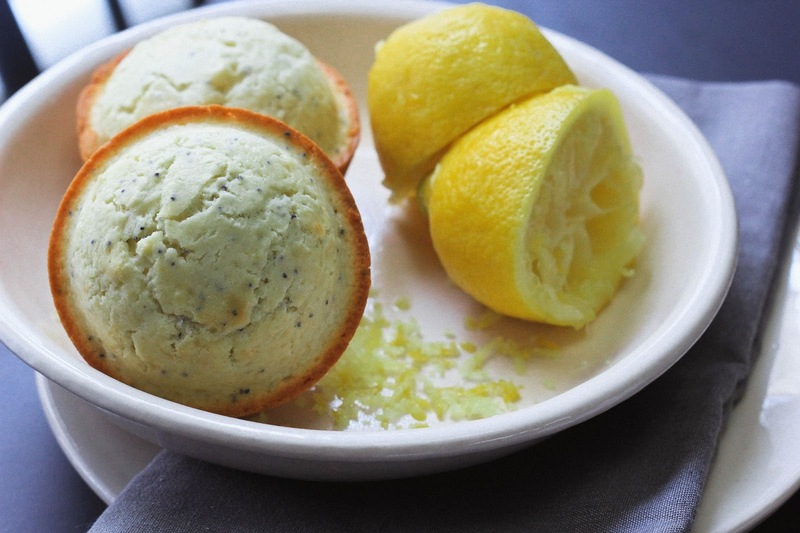 So I have a few lemon recipes that are soon to come. My favorite being what you see here today. The first batch of these muffins I made in mini form. 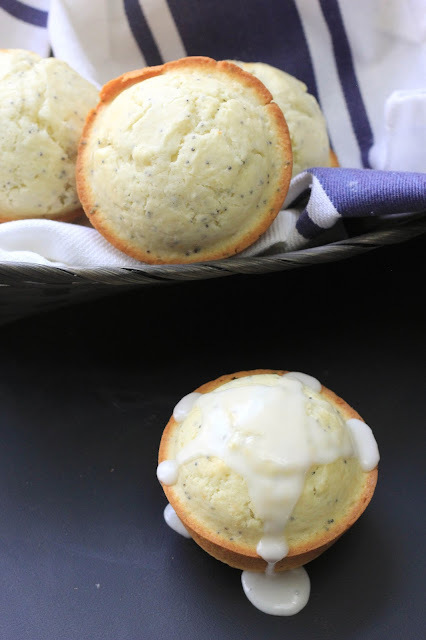 However, after devouring 20 mini lemon poppy seed muffins in one sitting I felt bad about myself. Therefore, I decided that it would be best to make them in a large muffin tin. Consuming 2 large muffins in one sitting just sounds better than 20. Don't cha agree? Unfortunately, I don't have an old wood table to photograph these insanely good muffins on. And my husband won't let me paint the walls of our kitchen like the inside of an old french farmhouse. and doesn't call for Millet flour. In a large bowl, whisk together the flour, sugar, baking powder and poppy seeds. In a separate bowl, mix together eggs, milk, melted butter, lemon zest and juice. Stir wet ingredients into dry ingredients until moistened. 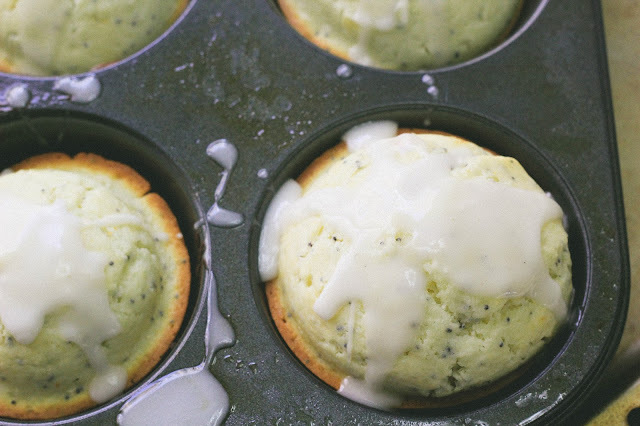 Spoon batter into light greased muffin tins and Bake at 350 for 25 to 30 minutes. These are best when served fresh out of the oven drizzled with a little sweet icing my grandma used to put on everything. Simply stir together one cup of powder sugar with 1 1/2 tablespoon of lemon juice. 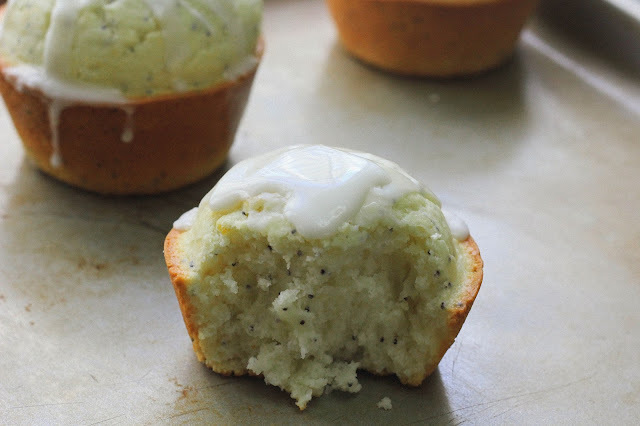 Drizzle over warn muffins.